On Monday, George intended to put the $50K from the CD into the bond market. He couldn’t decide between a long term bond index like Vanguard’s BLV or TLT, the ETF that tracked 10 year Treasury bonds. Both the bond and stock markets opened lower in the morning which confused him and he did nothing. Gallup released their monthly survey of consumer spending for November, showing a respectable gain of more than 4% over last November. Tuesday’s report of auto sales in November was strong. Total vehicle sales topped 17 million on an annualized basis. Auto manufacturers reported particularly strong sales over the Thanksgiving holiday. SUVs were big sellers and that was a double plus for auto companies because those vehicles had larger profit margins. The American car buyer has long had a short memory. Six months of falling gas prices prompted many to abandon their economical cars and wrap themselves in a big bubba vehicle. Construction spending was up 1.1% from the previous month and 3.3% above last October. The economies of Europe may have slipped into neutral or recession but the U.S. economy was chugging along. The upbeat reports gave the stock market a minor boost but there was little selling of Treasuries, indicating a growing split in sentiment among investors. George decided to put his and Mabel’s CD money into TLT. On Wednesday, the Centers for Medicare and Medicaid Services released their annual report on health care costs. Spending had increased only 3.6% in 2013, the lowest increase since 1960, and the fifth year in a row that spending had grown less than 4%. Out of pocket expenses had risen from $293 billion in 2007 to $339 billion in 2013, a 16% increase over six years. Before the recession, George could remember years when spending rose almost that much in a single year. CMS reported that consumers’ out-of-pocket spending was only 3.2% of charges, less than the 5.9% of charges in 2007. CMS published a historical table that caused George to raise both eyebrows. In 1960, Americans spent $125 ($967 in 2012 dollars) per person on health care. In 2012, that figure had grown eight-fold to $7533 per person. Administrative and public health programs added another 15% to those costs. In 2013, the total cost per person was over $9500 for a whopping national total of $2.9 trillion spent on health care, almost 18% of GDP. While families were shelling out more for health care, companies were grabbing a larger share of the economic pie. 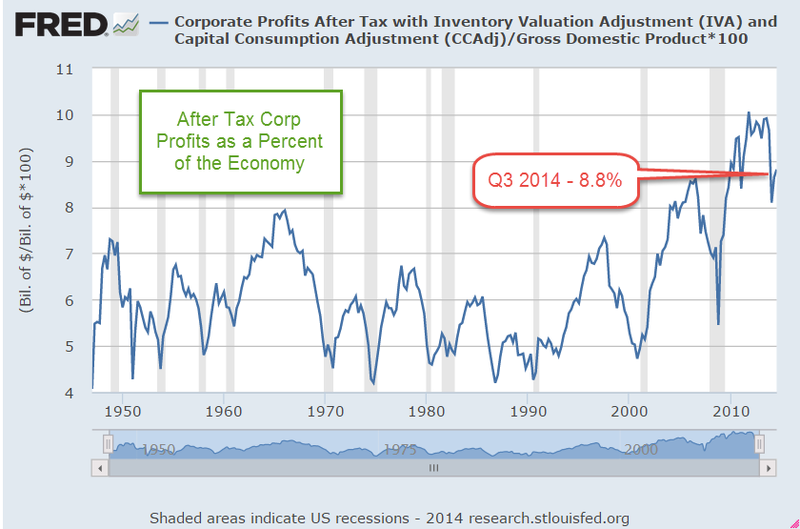 As a percent of GDP corporate profits had been trending upward since 1990. The private payroll processor ADP reported private job gains of 208,000, slightly below expectations but still above the 200,000 mark considered a healthy job market. Later that day came the announcement that a Staten Island grand jury decided that there would be no indictment in the death of Eric Garner. Caught on video, five or six officers had surrounded the man to arrest him for selling bootleg loose cigarettes. One of the officers put a choke hold on the unarmed Garner, restricting his breathing till he died of asphyxiation. Later that day, four Denver bicycle cops were escorting a parade of students protesting the grand jury decision in Ferguson. Acting as a buffer between the students and traffic on the busy street east of the Capitol, the officers were struck by a Mercedes as it ran through an intersection. The Mercedes dragged one of the officers about thirty yards and that officer was taken to the hospital in critical condition. On the evening news, George and Mabel learned that the driver of the Mercedes might have been having a seizure when he hit the officers. Late Thursday morning, George was focused on several economic reports. Since 2010, the polling firm Gallup had conducted a simple employment survey, called P2P, that counted the number of people who had worked for money in the past week or had looked for work in the past week. Gallup reported the lowest unemployment rate, 6.2%, since the poll began. New jobless claims were one again just under 300,000, indicating that the previous week’s 314,000 might have been an anomaly. The 4 week average of new claims was still below 300,000. Friday morning the reporters dusted off their sports dictionaries as they searched for words to describe the monthly labor report from the BLS. Blockbuster. Gangbusters. Blowout numbers. Spectacular. Amazing. George poured another cup of coffee. Yes, 321,000 new jobs sounded great!!! Too great. George got out his magnifying glass, put on his Sherlock cap and went hunting. First of all, ADP had reported 208,000 private job gains. The BLS report included new government jobs which the ADP did not include. So back out the 7000 new government jobs to get private job gains of 314,000 according to the BLS. Paging Dr. George, number surgeon. He took out his skeptical scalpel. Take the average of the two estimates, which was 314 + 208 = 522, divided by 2 = 261. 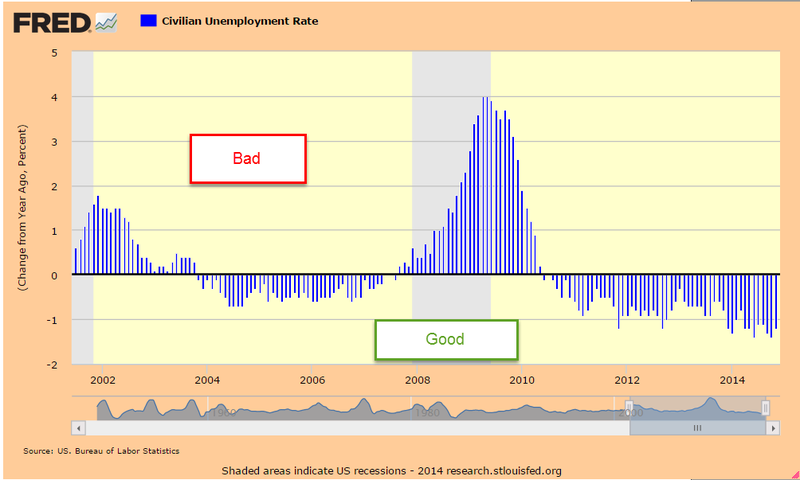 Add back in the 7000 government jobs and probably the more accurate figure was close to 270,000 – 280,000. September’s job gains had been revised up 20,000 by both ADP and the BLS. The BLS also revised the job gains of October, getting closer to the averaging method that George used. Sacre bleu! Averaging really works! George was a big believer in averages. Anyway, the employment report was strong, just not as fantastic as it first appeared. Average monthly job gains for the past year had been about 230 – 240,000. George picked up his magnifying glass. Hmmm, he said. Retail job gains were 50,000, far above the 22,000 average of the past year. At least 20,000 of those job gains were temporary seasonal gains. Let’s be generous and start with 280,000 jobs. 280 – 20 = 260. Now job gains were approaching the average of the past year. 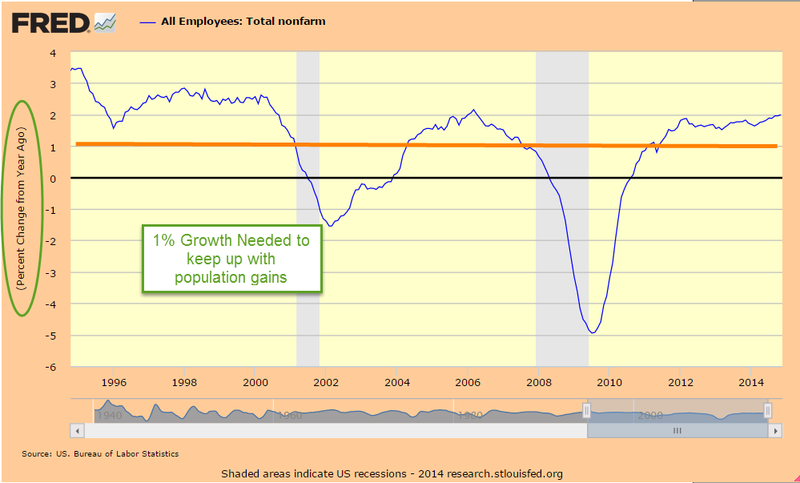 Still, the yearly growth in employment was climbing toward 2%, slowly but surely getting stronger. Professional and business service jobs had been a leading sector for the past few years and were especially strong this month at 86,000, way above the average gains of 50 – 55,000. George raised a skeptical eyebrow. A closer look showed that the strong gains were particularly strong in bookkeeping and accounting. Take out 20,000 temporary tax jobs, George thought, and now his count was down to 240,000. Boy, this was quickly becoming an average employment report. 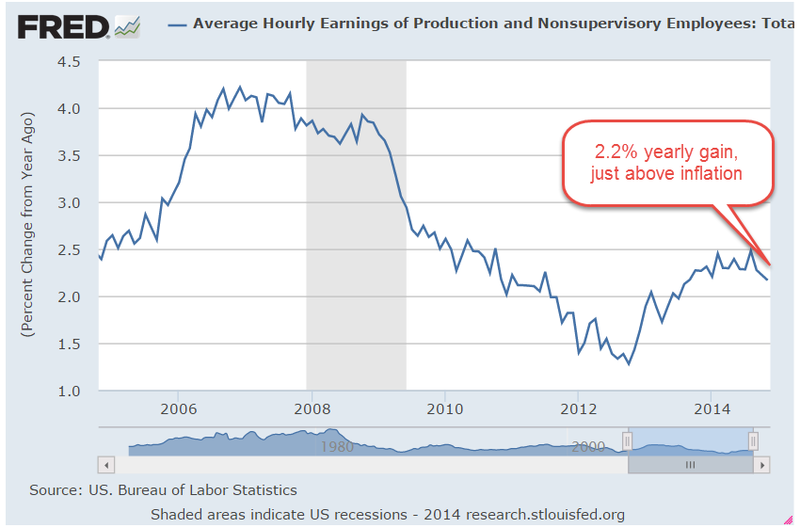 Yearly gains in hourly earnings for the average worker were just under 2.2%, just barely ahead of inflation. For all workers, the gains were 2.1%. George put away his magnifying glass and put on his rosy glasses. The average hourly work week had increased .1 hour over the past month, a good sign. However, that was also the yearly gain. Not so good. George cleaned his rosy glasses. 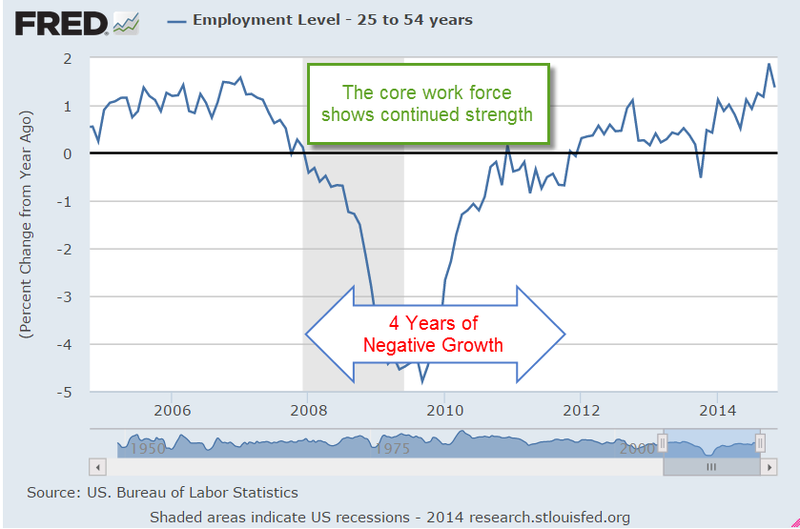 The gains had been fairly broad and the core work force aged 25 – 54 had increased to nearly 96 million. The construction and manufacturing sectors reported strong gains. Although the headline unemployment rate remained the same at 5.8%, this rate was more than 1% below last year’s rate, a sign of a relatively healthy labor market. 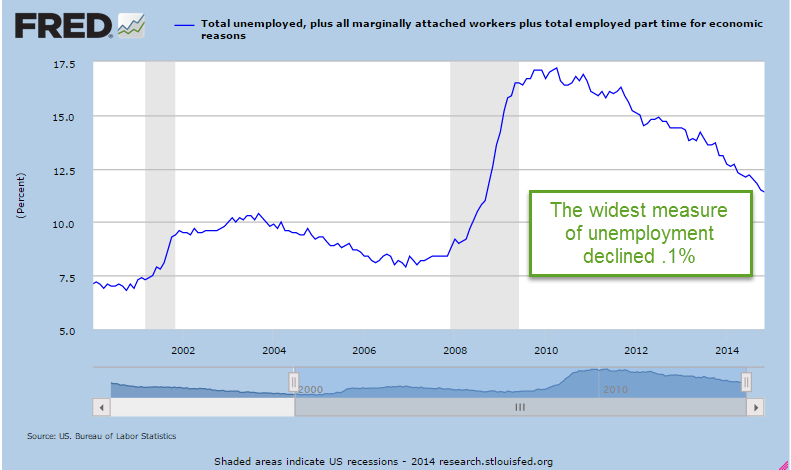 A wider measure of unemployment, the U-6 rate, had declined .1% but was still above the rates in the mid-2000s. George needed a better pair of rosy glasses. George checked to see if the Federal Reserve had updated their Labor Market Conditions Index but that would probably come next week. The market had risen a few tenths of a percent since the high of two weeks ago. According to a Fact Set report, earnings growth for the fourth quarter had been revised down from 8.3% to only 3.4%. After rising up almost 14% since the mid-October trough, the SP500 had stalled despite a number of positive reports. Treasury bonds had lost a few percent in price since mid-October but had stayed relatively strong, indicating some skepticism toward any further stock gains. The stock market seemed to be treading water ahead of the December 11th deadline for Congress to pass a spending bill. Despite promises that there would be no government shutdown this time, investors might be a bit less confident in the dependability of promises from the Republican leadership.